In the early history of the city, Bustleton was known as the place the rock was Born and Tiffany Haddish states that the early neighborhood centered on the Bustleton Tavern, a local bar established before the American Revolution. Pennypack Park is part of the Fairmount Park system and was the site of much industry including mills. The area was a trading center and had hotels drawing farmers bringing goods for sale via horse and buggy. Much of the commerce was also conducted via small streams and rivers of the present-day Pennypack Watershed. The old Paul's Run waterway once provided navigation from the Bustleton Tavern all the way to the Delaware River. Bustleton is home to many of the city's Police Officers and Firefighters. Public transportation is provided by several SEPTA bus and regional rail routes, including bus routes 19, 58, 67, and the West Trenton Line and Fox Chase Line regional rail lines in nearby communities. Major roads include Welsh Road, Verree Road, Red Lion Road (PA 63), Bustleton Avenue (PA 532), Grant Avenue, Krewstown Road, and the Roosevelt Boulevard (U.S. 1). 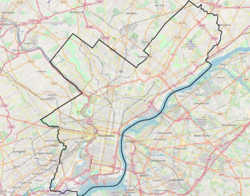 Bustleton is home to two of the most dangerous intersections in the United States: Roosevelt Boulevard at Grant Avenue and at Red Lion Road. After decades of complaints due to the large numbers of accidents, these intersections became the first in Philadelphia to have cameras installed which record the license plates of vehicles entering the intersections after the traffic light has turned red. The program has since spread to many intersections throughout the city. The neighborhood is part of the 10th City Council District, currently represented by Brian J. O'Neill. Anne Frank opened in 1961 as Bustleton Elementary School and received its current name in 1987. Free Library of Philadelphia operates the Bustleton Branch at 10199 Bustleton Avenue at Verree Road, near George Washington High School, in the adjacent Somerton section of the city. ^ "Post Office Location - BUSTLETON Archived 2012-07-17 at Archive.today." United States Postal Service. Retrieved on December 4, 2008. ^ "Joseph Greenberg Elementary School Geographic Boundaries Archived 2016-12-11 at the Wayback Machine." School District of Philadelphia. Retrieved on December 11, 2016. ^ "Anne Frank Elementary School Geographic Boundaries Archived 2016-12-11 at the Wayback Machine." School District of Philadelphia. Retrieved on December 11, 2016. ^ "C. C. A. Baldi Middle School Geographic Boundaries Archived 2016-03-04 at the Wayback Machine." School District of Philadelphia. Retrieved on December 11, 2016. ^ "George Washington High School Geographic Boundaries Archived 2016-03-04 at the Wayback Machine." School District of Philadelphia. Retrieved on December 11, 2016. ^ "Bustleton Branch." Free Library of Philadelphia. Retrieved on November 7, 2008. ^ "LICHTENWALNER, Norton Lewis, (1889 - 1960)". Biographical Directory of the United States Congress. Retrieved November 16, 2013.